What is epimedium? What is it used for? Epimedium is a large, leafy plant native to China which has been given the humorous moniker of "horny goat weed" for its alleged sexual potency. The plant has short, thin stems and large, shovel-shaped green leaves that are harvested during the summer and fall. Some species of epimedium also contain green or purple flowers, but they all have the same medicinal properties. The above-ground portions of the plant, including the stems, are used in herbal remedies. Epimedium is used for a variety of disorders. It is sometimes used alone or with rehmannia to treat impotence and frequent urination, and as an aphrodisiac. It is also used to treat arthralgia, rheumatic conditions, back pain and muscle spasms. In traditional Chinese medicine, epimedium is believed to tonify the kidney by strengthening kidney yang, dispelling wind and eliminating dampness. How much epimedium should I take? 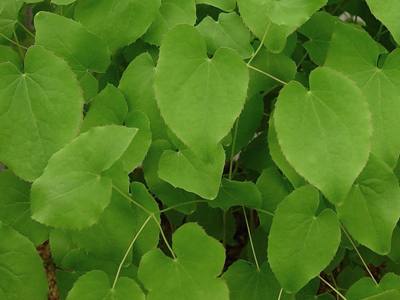 Most practitioners recommend 6-12 grams of epimedium depending on the condition being treated. The herb can be decocted in water for an oral dose; ormacerated in wine for an infusion; simmered into a soft extract, or mashed into a powder. 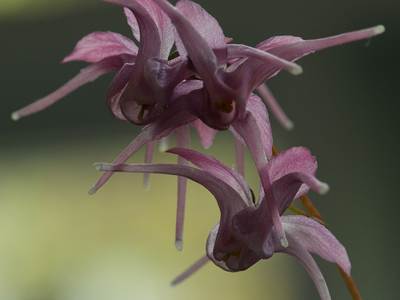 What forms of epimedium are available? Dried epimedium leaves can be found at some Asian markets and specialty health food stores. Epimedium powders and extracts are also available. What can happen if I take too much epimedium? Are there any interactions I should be aware of? What precautions should I take? Because epimedium has a "drying" effect in traditional Chinese medicine, it should not be used in cases of hyperactivity of fire due to yin deficiency, or by people who are otherwise yin-deficient. As of this writing, there are no known drug interactions with epimedium. As always, make sure to consult with a qualified health care practitioner before taking epimedium or any other dietary supplement or herbal remedy. Dong X, et al. Effects of sichuan herb epimedium on the concentration of plasma middle molecular substances and sulfhydryl group of yang-deficiency [in Chinese.] Chung Kuo Chung Yao Tsa Chih Apr 1995;20(4):238-9, 254. Hiltunen R, et al. Isolation and immunomodulatory effect of flavonol glycosides from epimedium hunanense. Planta Med 1997 Aug;63(4):316-9. Liao HJ, et al. Effects of epimedium sagittatum on quality of life and cellular immunity in patients of hemodialysis maintenance [in Chinese.] Chung Kuo Chung His I Chie Ho Tsa ChinApr 1995; 15(4):202-4. Shen CC, et al. New prenylfiavones from leaves of epimedium sagittatum. J Nat Prod Apr 1996;59(4):12-4. Wang J, et al. Effects of epimedium sagittatum on soluble IL-2 receptor and IL-6 levels in patients undergoing hemodialysis [in Chinese.] Chung Hua Nei Ko Tsa Chin Feb 1995;34(2):102-4. Horny Goat weed (epimedium) has been renowned in China for ages, as an aphrodisiac, a kidney yang restorative, and a liver tonic herb. Epimedium is combined with a synergistic blend of potent Chinese herbs, traditionally used to help support the health function of kidney, liver and heart, and to promote healthy levels of natural energy. The Chinese believe that the kidney stores the essential energy (ching), which they regard as supporting the vitality of life and sexual vitality. Stress and the hectic modern lifestyle are considered to diminish the ching, and Chinese herbalists often recommend periodic restorative yang tonics to both men and women. Regular tonification of kidney and liver was believed to contribute to good health and longevity. It also was considered to help promote the healthy function of the back, bladder and joints and to help maintain healthy normal memory. The traditional time-tested way to use these beneficial herbs was brewed as a tea.